Jerry D. Ruud, age 78, entered into rest on Monday, April 1, 2019 at the Ottawa County Health Center, Minneapolis, Kansas. He was born on December 9, 1940 in Concordia, Kansas to Arthur and Lillian (Cyrier) Ruud. Jerry went to country school at district #19 and district #93, he then started the 8th grade in Concordia. He was a 1958 graduate of Concordia High School. 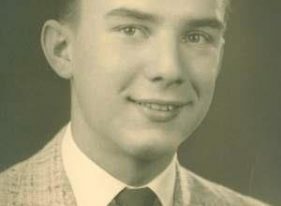 He received his Bachelor’s Degree in Finance from Emporia State University in 1966. He married Carol Menzies on July 22, 1967 in Concordia, Kansas. Jerry worked as a Bank Examiner for the FDIC for many years. He then worked in Banking in the Rock Rapids and Rock Valley, Iowa communities. Jerry also later worked as a real estate agent serving in the Concordia community. Jerry enjoyed horses, hunting, trap shooting, golf, playing cards, and most of all spending time with his family and friends especially his grandchildren. He is survived by his children Brian Ruud, wife (LeLe) and their children, Brooklynn and Ethan of Flowood, MS.; Stacy Mowry, husband (Craig) and their children, Luke and Linnea of Thief River Falls, MN. ; Brandon Ruud, wife (Deana) and their children, Tyson and Sydney of Basehor, KS. ; The children’s mother, Carol Ruud, Concordia, KS. ; his brother, Wayne Ruud, Concordia, KS. ; sister-in-law and brother-in-law, Marylu and John Fellows of Concordia, KS. ; a nephew, Jeremy Beems and his children Landon and Lakyn of Ottawa, KS. ; a niece, Jill Billinger, husband (Joe), Victoria, KS., and their children, Dylan, Zach and Garret. He was preceded in death by his parents, Arthur and Lillian. Visitation will be held 9:00 a.m. until service time at 10:30 on Saturday, April 20, 2019 all at Chaput-Buoy Funeral Home, Concordia. Cremation has taken place and a Memorial Service will be held 10:30 a.m., on, Saturday, April 20, 2019 at the Chaput-Buoy Funeral Home in Concordia, Kansas with Rev. Dean Frazier officiating. A private inurnment will be held at a later time. Memorial Contributions may be given to Nicol Home, or Kansas-NAMI in c/o Chaput-Buoy Funeral Home, Concordia. For online Condolences, please visit www.chaputbuoy.com.